If you are new to the automotive world, you may be asking yourself what a dyno graph is. A dyno graph displays the torque (in ft lbs) and horsepower (HP) that an engine makes over the engine's rotations per minute range (RPM). Your next question may be "What is torque and what is horse power?" Torque is the force (measured in pounds) it takes to cover a distance measured in feet (torque = lbs x ft) and HP is the torque value divided by the amount of time it takes to reach that distance. (HP = torque (ft lbs)/ time (s)). It may be easier to understand in practical terms. Say you have a 20 lb box and you want to lift it 3 ft off the ground. In order to lift 20 lbs, you need to apply 20 lbs of force. Therefore the torque is equal to the 20 lbs of force multiplied by the 3 feet it traveled equaling 60 ft lbs. Now, HP is equal to the 60 ft lbs of torque divided by the (lets say) 5 seconds it takes to move it 3 ft, so the HP then equals 12. So this individual makes 60 ft lbs of torque and 12 HP while lifting a 20 lb box 3 feet up in 5 seconds time. This is how the engine works. An engine can be designed to produce more torque creating a quicker acceleration from the throttle and more HP can be produced to get to the destination quicker. That is when Johnson Engine Technology comes in best! It is important to have the proper balance or else the amount of HP you have means nothing. Now torque is shown to be displayed on the graph with the colors pink and light blue (as indicated by the small color blocks). The pink block corresponds to the pink line on the graph representing the JET.EV-27 combo because it is a shade of red (96 ft lbs torque); and the light blue block corresponds to the light blue line on the graph representing the torque value of the stock EVO bike because it is a shade of blue (75 ft lbs torque). The same happens with the HP found on the left of the graph. The color blocks indicate HP to be displayed on the graph with blue and red lines. 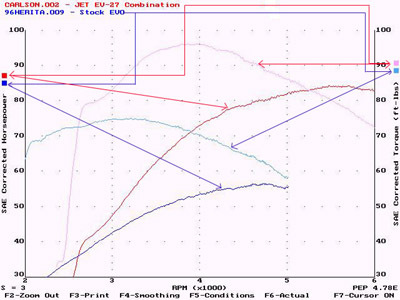 The red line then shows the HP value of the JET EV-27 combination (84 HP) which is compared to the blue line displaying the HP value of the stock EVO (only 58 HP). It is evident here by the graph alone that a bike with the JET EV-27 combination performance package by Johnson Engine Technology makes 26 more HP and 21 more ft lbs of torque than the 96 Heritage Stock EVO bike. So what do you think...need some modifications?